Healthy and Gourmet: Zucchini Flatbread and Tag: a game of getting to know more about our favorite bloggers. Zucchini Flatbread and Tag: a game of getting to know more about our favorite bloggers. A while back, I received the following fun exercise from Gera at Sweet Foods. The purpose: getting to know more about our favorite food bloggers. Now, it's my turn. Following Gera's example, I have attached some photos, some random ones chosen from a few of my trips. 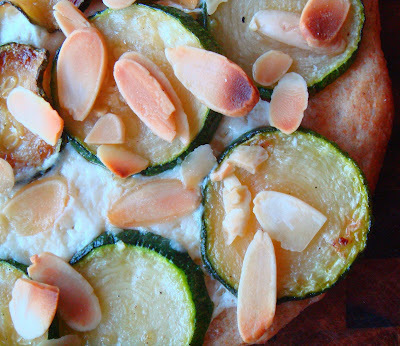 First, though, here is my newest flatbread recipe: zucchini, almonds and mozzarella. Initially, I intended to make a simple zucchini flatbread but realized that I had a handful of slivered almonds left and not wanting them to go to waste ( nuts in general last a a good two or three months in the pantry, even longer in the freezer, before turning rancid) I added them to the mix. And not a bad idea either. 1. To make the dough: In a mixing bowl, add the water to the yeast and sugar, set aside until foamy, about 10 to 15 minutes. Add the flours and salt and mix into a ball. Remove to a flat, floured working surface and knead until soft and elastic about four to five minutes. Set in the mixing bowl that has been oiled. Cover and let rise for about an hour. 3. Roll the dough unto a well greased baking sheet to about one eighth of an inch thick. Evenly layer the zucchini and mozzarella. Finally, sprinkle the almonds. Bake at 450 degrees for ten to twelve minutes. Serve while still warm. Now, on to the questionnaire. I'm a LOST junkie! It's the first series I actually followed from season one and I'm still hooked. Also watch Law and Order, CSI and anything interesting on Discovery and National Geographic. What kind of breakfast do you have usually? It depends on whether I'm eating alone or with my husband. Alone: some sort of cereal. With my husband: pancakes and omelette, or a traditional Trinidadian breakfast. Pearl. Yes, Pearl. When I was born, being her first granddaughter, my grandmother thought I was her little gem, hence "Pearl. " I'm just grateful Diamond or Gold didn't come to her mind. Which kind of food can't you stand? Favorite name (at the moment)? Which trait or character don't you like? 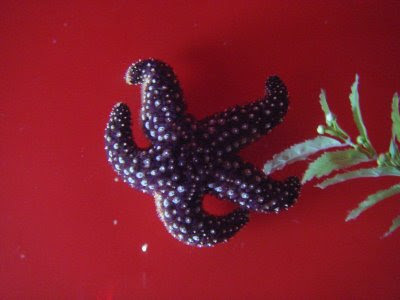 Star fish at Aquarium in Minneapolis. Badgley Mischka, Cache, Banana Republic, BCBG, Adidas. If you could take the aeroplane to go somewhere, where would you go? Where would you want to live when you are retired? Hawaii. I could seriously spend my days snorkeling, hiking the Na Pali cliffs, and eating fresh seafood. Which birthday do you remember the most? My last: my father and youngest sister had visited; I hadn't seen them in more than three years. If you were a color, which one would you be? Coffee! I started drinking coffee in college to stay up to study. Now, it seems I cannot start my day without a cup. Nothing fancy, just regular coffee; I grind my own beans though. I do have tea on most evenings. Feeding the animals, Wild Animal Park, San Diego. The last person you had on the phone? My sister Nancy in Toronto. We speak to each other almost everyday. Sweet! My sweet tooth is going to be the end of me. The day of the week you prefer? Wednesday night because LOST is on! I didn't know there's an aquarium in Minneapolis! Is it the one at the Zoo (one of our favorite places)? It was great learning more about you; I can totally relate to your being a red-hued, coffee-drinking, chocolate-loving sweettooth! enjoyed the recipe....but i liked the questionnaire and pics too! Ricardo, yes, the vibrant green of zucchini makes almost any dish look good which is great since we eat with our eyes first, no? 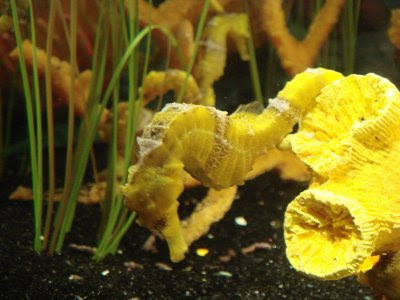 T. Noodle, the aquarium in the photo is the indoor one at the MOA. I think you will like it there. Marina, I just thought about making a questionnaire for you. on it: chem and bio questions. hee hee. Sophie, isn't Lost some show?! I've never been so engrossed in a series before. 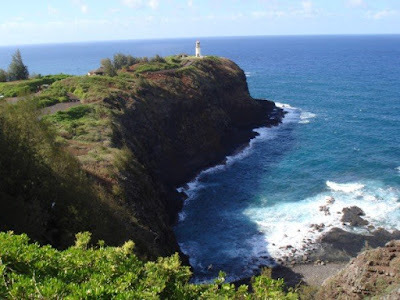 I'll be visiting some of the actual places in Hawaii soon. So excited!